Suggestions and reviews of computer games with no or limited violence - puzzle games, mysteries and more - which can be enjoyed by players of any age. While there is a huge market for PC and computer games, most of the focus is on expensive, flashy, titles usually with violence. This article and its linked pages focuses on games affordable for a lower budget - puzzle games, mysteries and more - which can be enjoyed by players of most ages, and usually on computers that aren't top of the line. Several of these titles can also be bought for Android, Mac, or even older consoles. 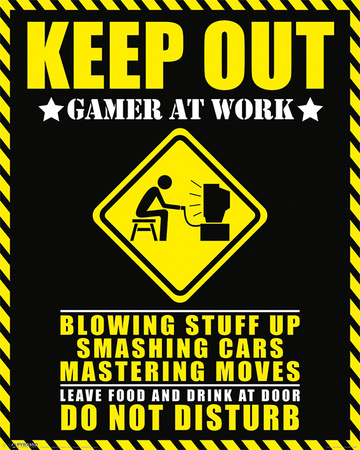 While the Wii console and similar brought console gaming back into the realm of the family, the experience of many console players online, and the image of gamers in general is far closer to the poster on the left. Blowing stuff up? Smashing things? Mastering moves? Gamers of the building generation: lego, simcity, and more, tend to get overlooked. Nowadays so do players who enjoy story-driven games: Shadow of Memories for the PS2 was a release title driven entirely by its story, and yet later consoles seem to have nothing similar. If you want a game that's not blowing stuff up (using a generic engine) or shooting people (using the same generic engine) it can be difficult to find. The other problem with PC games is the requirement for top-flight technology. Alienware and others are great - but very, very, expensive. If you're not playing new releases and top flight games however, this is not necessary. They ran on my fifteen-year-old laptop: 512Mb Ram (slow ram) and a 1Gb processor with no graphics card. One note about the old laptop: it has a very out of date vBios (videoBios) which cannot be updated, so some of the games that won't run for me might well run for you. If you are specifically looking for a place to start, I have an article below that features several enjoyable games in the hidden object, puzzle, and mystery genres. These have as little violence as I could include (Murder She Wrote obviously does include off-screen murders, but is otherwise on a par with the TV show), and are easy to pick up, making them a useful starting point. In the era of Gears of War and similar it can be hard to find non-violent games for children or simply because you don't enjoy them. Here are a few I enjoyed. Hidden Object games work by presenting you with pictures of a location and a list of objects (usually words, pictures, or silhouettes) which you have to find in that location. For some there is no real reason given, others give you a reward for finding them all, or other bonuses. Most hidden object games combine these screens with puzzles, including old favourites like Solitaire, matching tiles and Tower of Hanoi. Dark Parables is one of the best, as the objects you find are used to create items that allow you to solve puzzles like locked doors elsewhere in the game. Veronica Rivers 1 & 2 where scenes include things like finding the equipment to escape a locked room and similar. Without the hidden object scenes, traditional puzzle games were an early arrival on computers in the form of Point-and-click adventures. As your character travels from scene to scene you have to find objects to resolve items, unlock doors and usually solve a mystery. There are modern games based purely on MahJong, JewelQuest and similar, but they tend to lack the engaging story and replay value of the adventure style, so I will be focusing on the former. One of the most highly recommended (and I'll add my endorsement here) is Drawn. 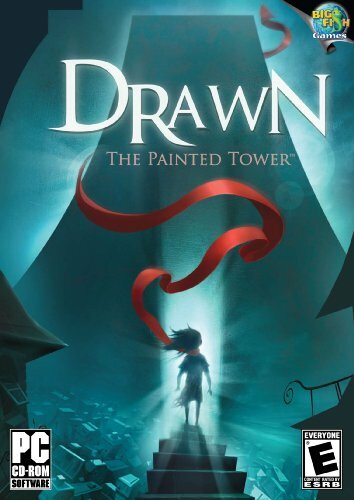 Drawn Painted Tower and Drawn: Dark Flight are absolutely excellent. Also available on Android and more. 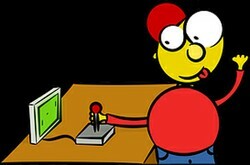 Drawn and its sequels are widely considered to be some on the best puzzle games ever released. The beautiful art, plot and clever puzzles make this an outstanding game. I used to enjoy gaming a lot, but I've noticed the range really has narrowed, unless you start looking for more unusual titles. And I spent far too many hours playing tetris! Once upon a time I was so addicted to the PC games that I would be glued to the screen. Now I know how and when to break and get up from my seat. I do love computer games and totally agree with you on non violence. In my days I used to play tetris and the likes.